Libraries and locations are where you keep your library resources, from which you loan them to patrons, and to/from which you arrange transits. Before you do anything else, you should at least add all of your libraries and locations; if need be, you can come back later to add things like library hours, etc. Library admin users can enter your school's Populi library URL right in your browser. It looks something like https://yourschool.populiweb.com/library/settings/general.php. Account administrators can find a link in Account > General > Customizations under Enable Library. Go to Library > Settings > Libraries. If you wish, you can enter a global due date—by this date, all resource loans from this library will be considered due. If you use this feature, you'll come back here every so often to update this field. Select an asset account for fine collections. You may need to have a financial admin user set up a new account for this purpose. Libraries need at least one location in order to hold resources. Add locations—just click add a location and give it a name. Repeat for each location in this library. If you wish, you can set hours for this library. These will display on the main search page that greets all patrons and users who visit your school's Populi Library page. Now that you've added this library and location(s), you have a spot for your resources to live. 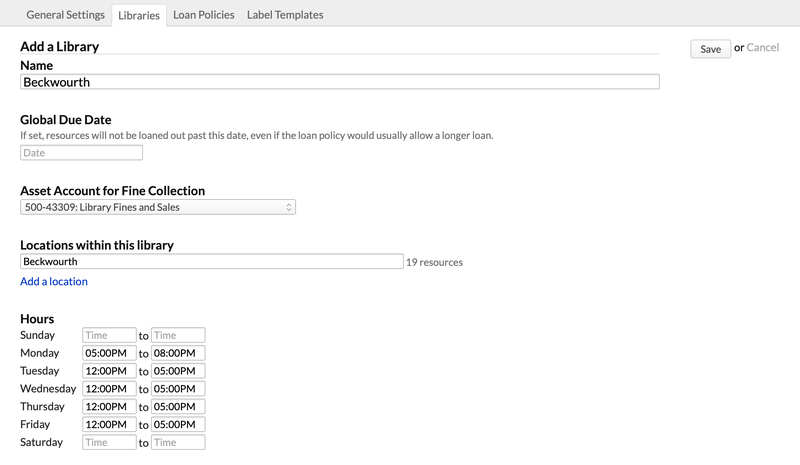 Next steps: Start setting up loan policies.